Our customers tell us these are the best Lotion Bars on the market. These bars are a solid moisturizer. The warmth of your hands activates the bar, leaving your skin silky smooth. The lotion lasts through several hand washing and is great for hands, feet and elbows. For extra dry hands or feet, apply heavily at bed time. Doing so while wearing cotton gloves or socks will deep condition your skin while you sleep. Made with Soy which seals in the butter and oils to keep skin moist; Shea Butter for rejuvenation, Aloe Vera and Vitamin E. All Lotion Bars come packed in a decoratively labeled 3 oz recyclable tins. 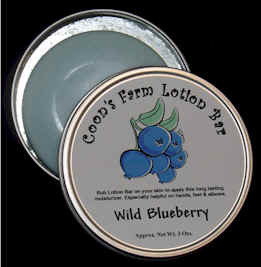 Lotion Bars are $9.95 per tin. Soft, fresh and clean as the fallen snow. Woody, green pine odor of freshly cut tree. Comfort of hot chocolate and marshmallows. An excellent mix of tart cranberry & the sweet mild allure of fig. A true version of a favorite flower. Incredible fresh juicy strawberries & bubbly champagne. Lots of character with a added touch of floral, green & citrus. Fresh cucumber & a light mix of melons. A stroll through a local orchard. A masculine ocean scent, with notes of musk. A fresh clean scent of the ocean. A warm, sweet, subtle fragrance sure to awaken your senses. A light blend of rose, daisy lily & daffodil. An unusual powdery floral derived from a beautiful flower from the Amaryllis family. A cool refreshing blast of mint. Mellow & soothing with just a hint of sweetness. Beach Blast: A fun blend of pineapple, coconut & honeydew melon. Fresh Cut Flowers (New! ): A heady blend of flowers, leaves & stems. Fresh Peach: Tart, sweet, juicy, and wonderfully realistic. Green Tea: Very unique herbal scent. Smooth & uplifting. Oh Man! : Citrus, hay, musk, green, fresh air, musk, oak moss, & patchouli. Red Clover Tea: Fresh & relaxing. Red Current: Sweet & tart at the same time. A very intoxicating berry scent. Sweetgrass: A complex, fresh grassy fragrance with a bit of a sweet note. Sweet Pea: A floral favorite from Grandma’s garden. Tea Tree: Anti fungal that stimulates the immune & respiratory systems. Vanilla Cream: A very warm rich, sweet, high powered vanilla. Wild Rose: A beautiful rose scent with a touch of tartness.